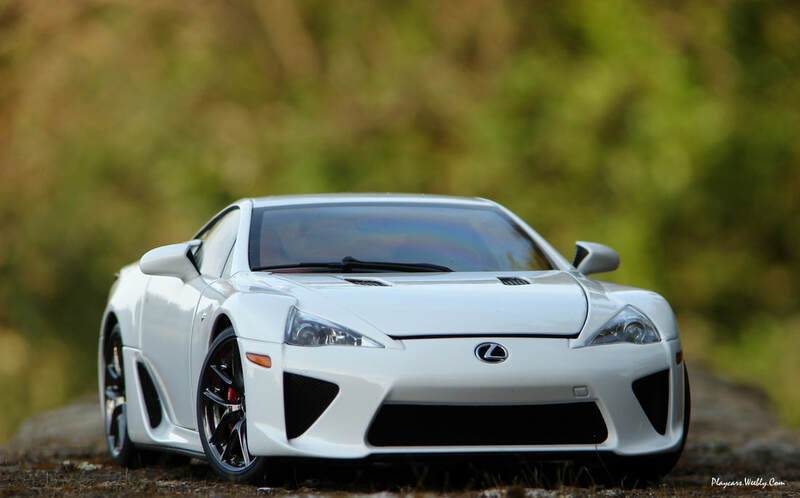 The second quarter of 2011 was a great period for the japanese super car's enthusiasts, the most wanted Lexus LFA was finally released and ready to hit the market. 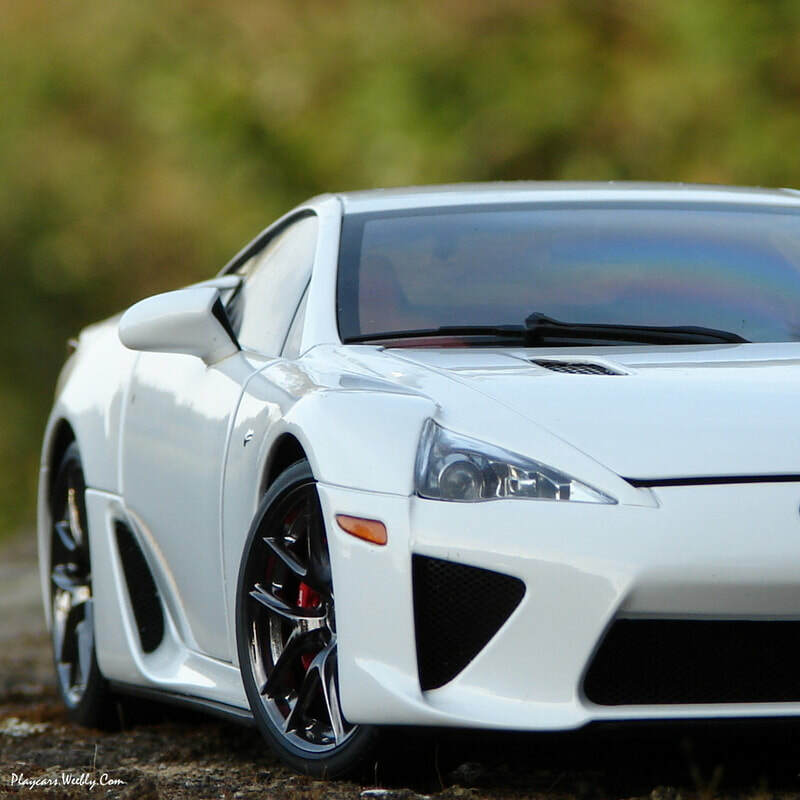 An unusual presence, the first super car coming from that part of the globe was chosen to be replicated as a part of the AutoArt's Signature collection. 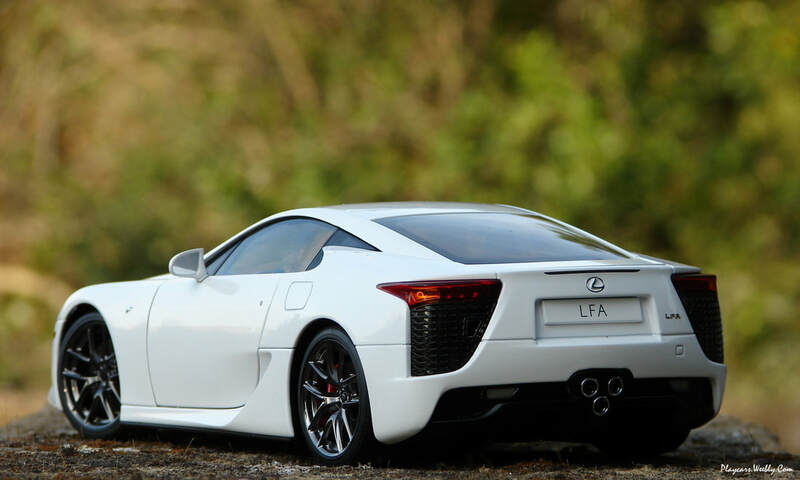 Built to complete their entry in Formula 1, beside the popular names in the super cars segment, Lexus LFA is an unusual and exotic presence with a high level of technology. 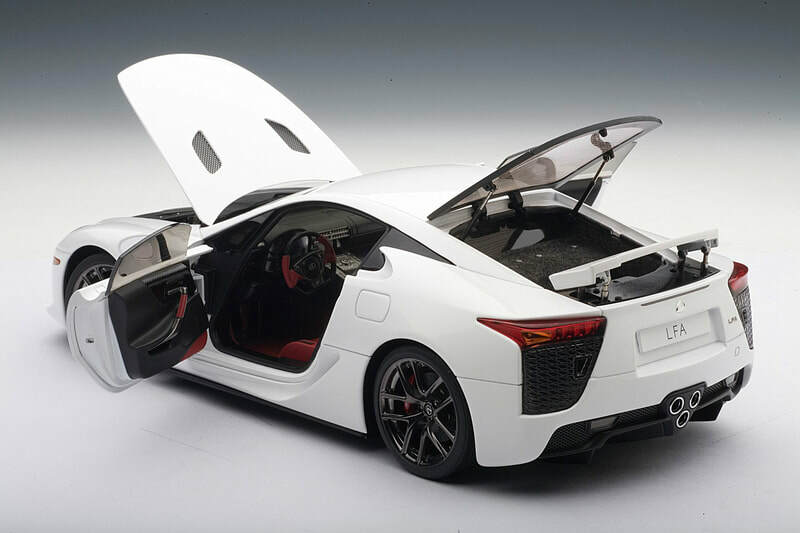 AutoArt released it in a limited edition, every model coming with its own number stamped underneath and on a certificate, but the total number of pieces remains still unknown. ​At the first contact, the model is feeling heavy, well put together and is very good looking painted in white- whitest white how they called it. Is the only version with a bi-color interior scheme and this was the main reason for me to chose it. Having a closer look, the paint job results to be flawless, the layer is glossy and well applied, without any imperfection. The red interior comes in contrast with the exterior color and the result is fabulous. 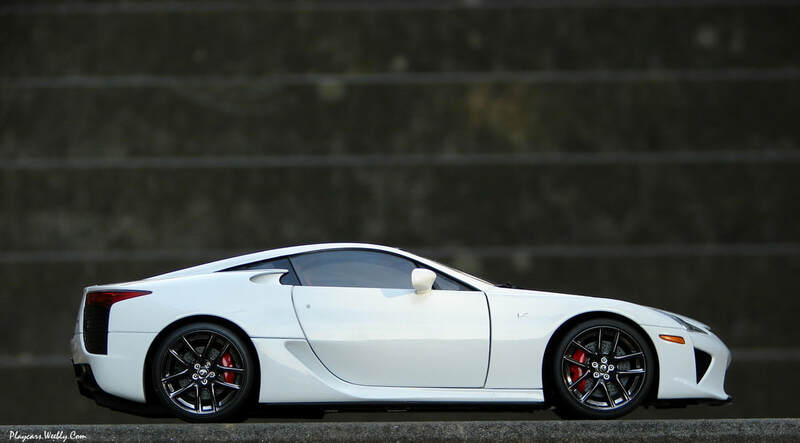 As expected, the model keeps well the original design, has a great stance and its overall look reflects perfect the real car attributes, the producer has made a great job here . The model appears to be well detailed and carefully finished, is no doubt regarding the quality, only good materials were used here. On the front side, the lights are an accurate replica of the real parts, keeping the complicate shape and all the accessories under the glass, even more on the rear side, where the LED segment is visible, along with the turn signals made in the right color. I'm a little disappointed about the third stop lamp, remembered here by a simple sticker, not the right choice for this level of manufacturing. The reverse lights are in place and all the air vents are covered with metallic mesh, excepting the huge grills under the taillights. The biggest air vents on this model are covered with a sort of a transparent plastic base, textured to look like real mesh and again, is not why a collector wants to see on a premium scaled model. I can't even understand the producer's choice, since the surface is big and the fake grills easy visible. To replicate the logos on both sides and on the back, they were first molded and after covered with metallic photo etched pieces and must admit are looking true to the original pieces. The same photo etched parts replicate the door's key bolts, how long for the generous size front logo they choose to develop an individual piece. This one was chrome covered and surrounded by a real mesh, very impressive and good looking for the entire ensemble's size. I don’t know how hard it was for AutoArt to replicate the dark chrome on the rims, but the result is top class. 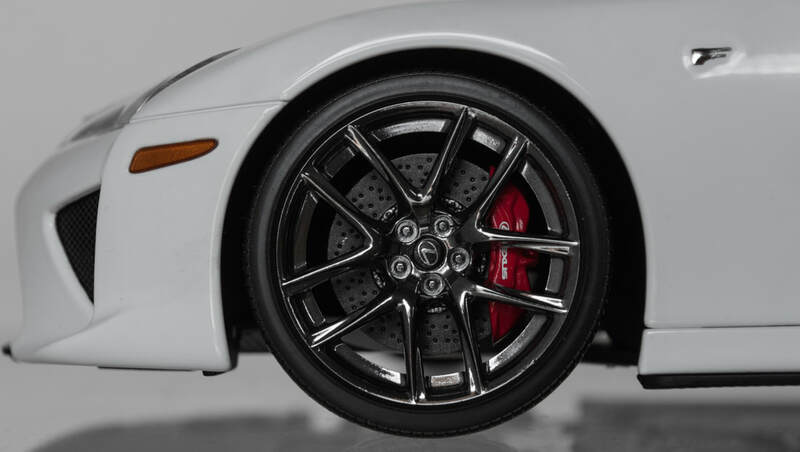 The rims are accurately made, having real looking studs and the car logo fixed in the center of the wheel. 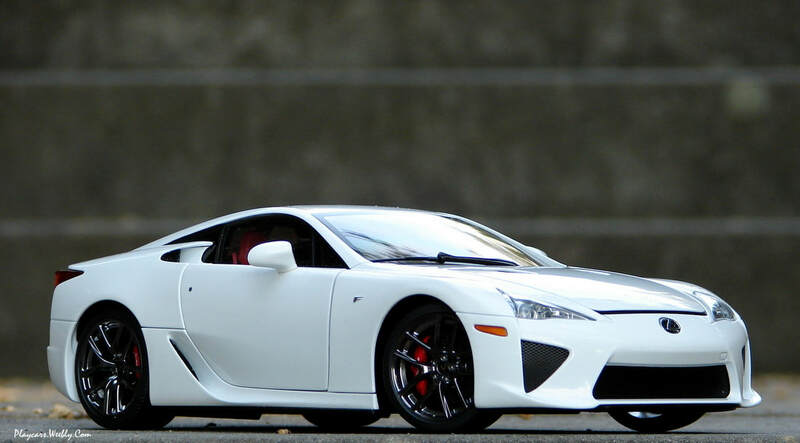 Behind, all the brake system is visible and replicated true to the real thing, with carbon look a like disks and cross drill, red paint on the calipers together with the "Lexus" inscription and logo. On the rear side the hand brake calipers are present but kept in black color. After such a good experience at the exterior, is now the time to see what the cockpit reserves to us. The manufacturer doesn't let us down, he used here 3 colors: red, black and grey and the same high level of finishing and details. Carbon fiber is the most used material on the real car, even if on the exterior is almost invisible, but inside the cockpit can be seen everywhere and is great replicated on the door panels, on the dash or steering wheel. The central console was finished in black and shiny grey plastic and keeps all the buttons individually marked. The most important piece of the interior, the steering wheel received a lot of attention with the same combination plus carbon fiber molded on and red plastic to replicate the leather. Some switches were put in place and they haven't missed the logos. On the door's panels and on the superior part of the dash board is visible the same molded pattern to remember the carbon fiber panels. Along with the already mentioned details, we can find an awesome red carpet, fabric made seat belts and great detailed pedals. Impressive work here, too! The front lid is opening on fine real hinges,a beautiful detail and an attached rod will keep it open as long as we can take a look to the engine. And of course a lot of things were put inside there, the little details are not missing at all, our replica can be proudly exposed near its real counterpart. 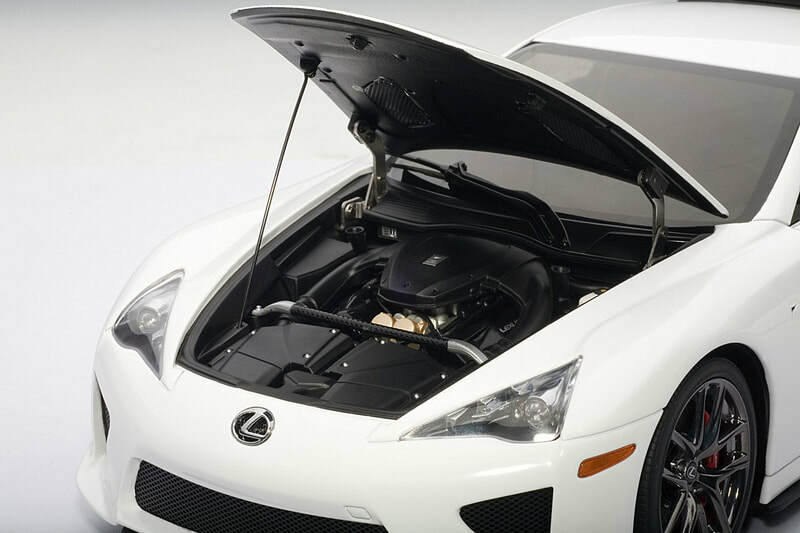 The engine was composed by separate pieces and offers a good view to the block, pipes, wires or radiator. 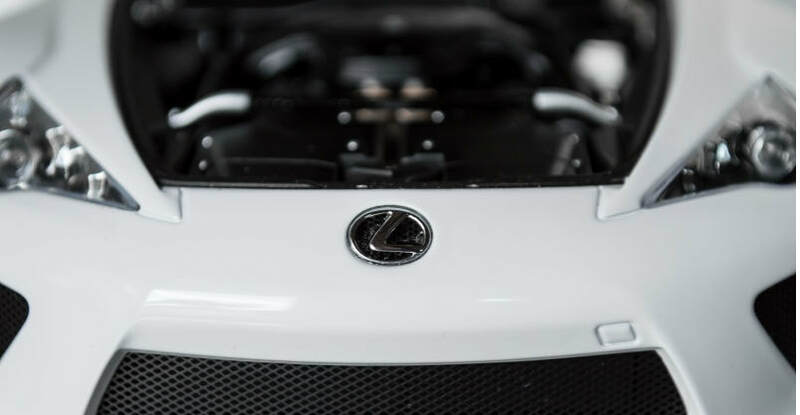 While the Lexus lettering and logo aren't missing, a container and a carbon covered stiffening bar represents some beautiful details, too. On the rear side, the lid is opening on a pair of struts and all the compartment were covered in grey carpet, here I'll give a plus for the presence of the lamp. 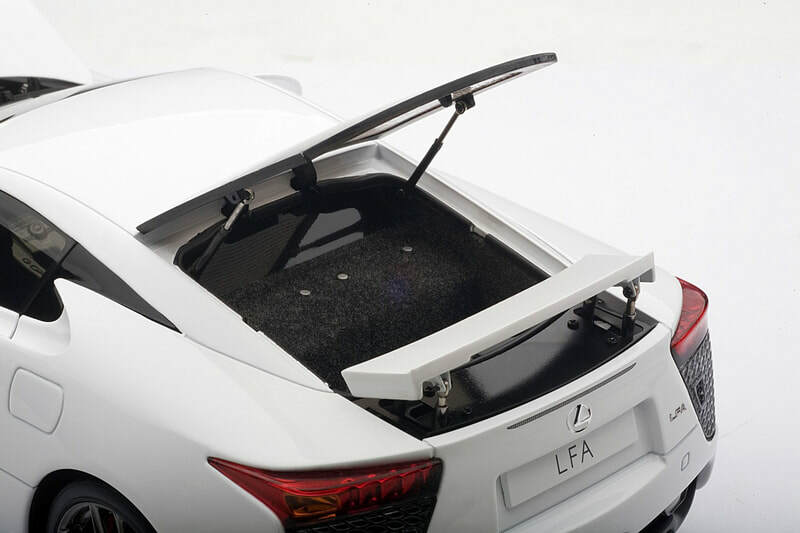 Some beautiful work could not be missed underneath, were on the flat surface, because we have a super-car here, where the aerodynamics asks for its rights, the carbon fiber panels were replicated by molded plastic. A little bit of engine and all the exhaust system is visible, with a lot of attention for the last mentioned. The protections and the suspension for every wheel were detailed and visible as well. 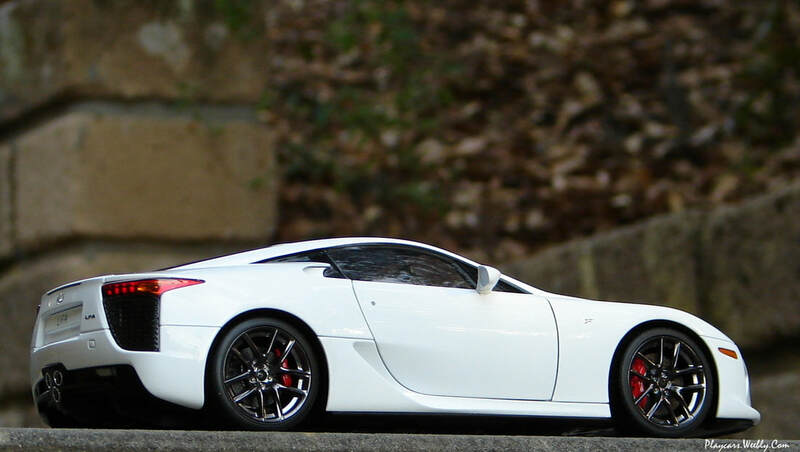 I'll end the review of this model of a car that I love in real in a more than a positive way, because it is really great. The producer managed to put together the essence of an unique super car and the high level of fine details and the result it feels premium indeed. 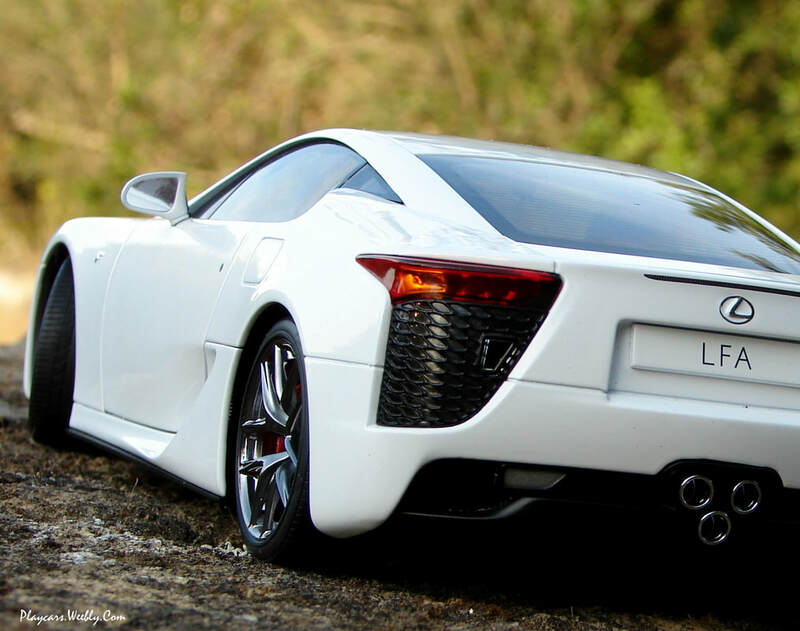 They made a great job in replicating the LFA and you'll be able to discover this on every single part of the model.